Classic cluster brooches in various shades are some of the most staple pieces in the Queen's brooch collection, and we saw several lovely ones this year, including the Pink Sapphire Cluster Brooch, which has become a favorite in recent years, and the Albert Brooch, Prince Albert's gift to Queen Victoria on the eve of their wedding in 1840. The Queen also wore the top portion of the Cambridge Emerald Brooch as a standalone cluster without its pendant in February for the opening of a national cyber security center; on another occasion, she wore the full brooch as well. 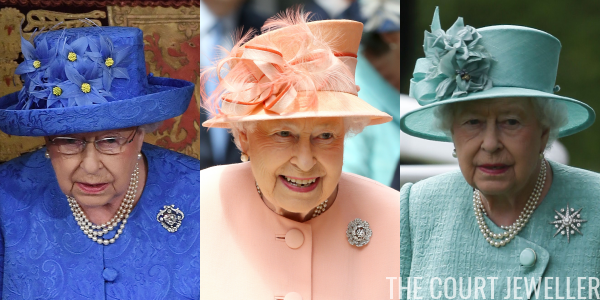 The Queen owns an incredible number of brooches with floral designs, and this year she wore many of them, including the Diamond Flax Brooch, which she sported for the final day of Royal Ascot. Another stunning, modern piece, the Diamond Daffodil Brooch, was worn for springtime engagements in Dunstable. 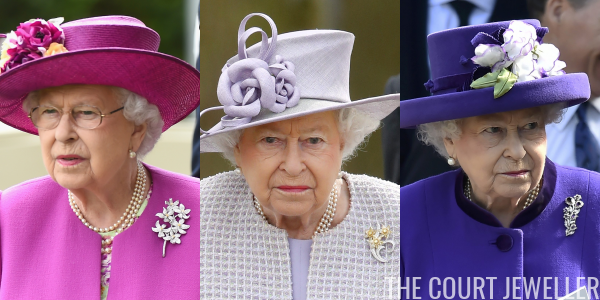 The Queen also chose her Amethyst Floral Brooch for a celebration of the life of her late former brother-in-law, Lord Snowdon. 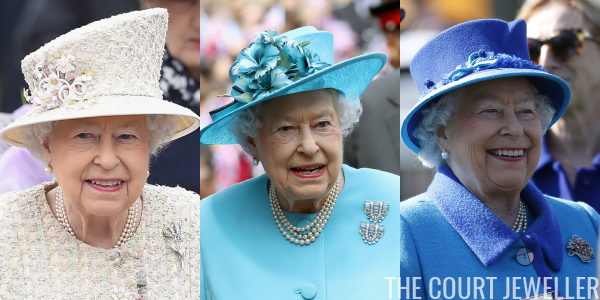 So many of the Queen's brooches are inherited pieces from decades and even centuries ago, and several of them were in the spotlight this year. One of the oldest still-worn brooches in her collection, the Kent Amethyst Brooch, helped her launch the UK-India Year of Culture in February. She also wore several brooches that belonged to her jewel-mad grandmother, Queen Mary, including her Russian Sapphire and Diamond Brooch (which was purchased from the estate of Empress Marie Feodorovna) and her Turquoise and Diamond Brooch (which was a wedding gift from her parents-in-law, King Edward VII and Queen Alexandra). 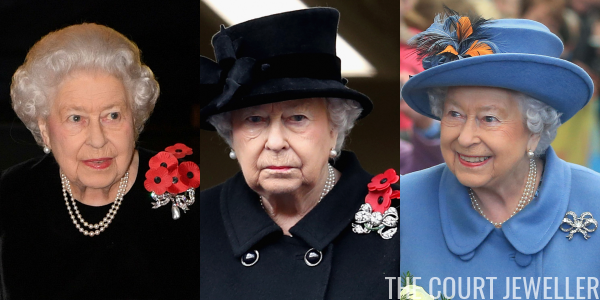 Queen Mary was also the source of two of the bow brooches that the Queen wore for Remembrance Weekend this November: the Dorset Bow Brooch and the Kensington Bow Brooch. 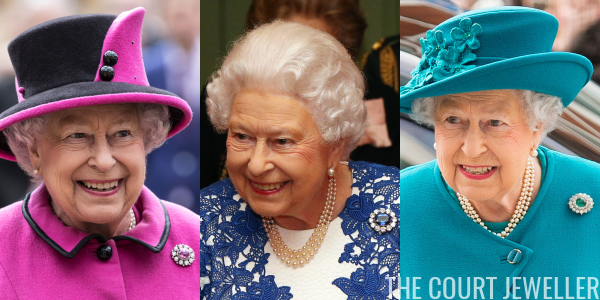 It was a good year for classic diamond bow brooches: the Queen also donned one of Queen Victoria's Bow Brooches on more than one occasion this year. Although many of the Queen's brooches are made of white metal, she also has numerous warm gold pieces, several of which had outings this year. A newer favorite is the Birds of Paradise Brooch, a Peranakan-style piece that was a Diamond Jubilee gift in 2012. 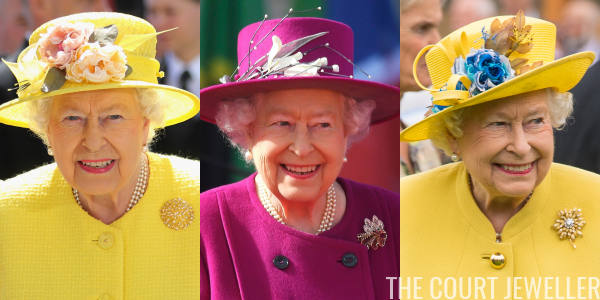 The Gold Trellis Brooch was one of her own wedding gifts in 1947; the Frosted Dahlia (or Sunflower) Brooch has been in her collection for decades. When the Queen Mother died fifteen years ago, the Queen received the lion's share of her jewelry, and she often wears brooches favored by her late mother. Especially popular this year was the Palm Leaf Brooch, but we also saw more than one outing for the Centenary Rose Brooch (a gift she gave her mother in honor of her 100th birthday). The elegant Courtauld-Thomson Scallop-Shell Brooch was the Queen's selection for Easter Sunday this year. 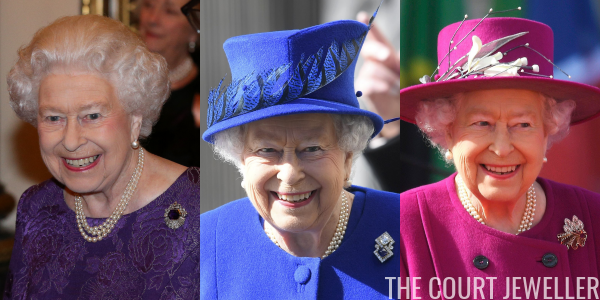 The Queen is monarch in multiple countries, so it's only right that her jewelry box is packed with brooches that represent various national symbols. 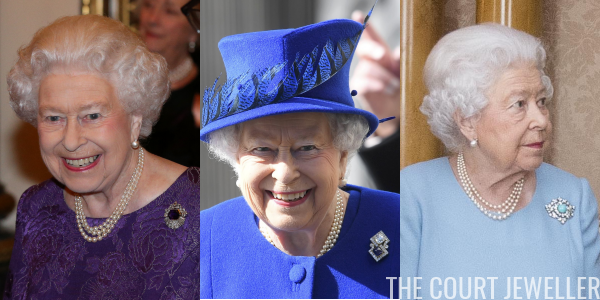 The magnificent Australian Wattle Brooch took place of pride at this year's Commonwealth Day Service, and the Diamond Maple Leaf Brooch was present at multiple Canada-related events (including the presentation of the brand-new Sapphire Jubilee Snowflake Brooch!). For the opening of the new Queensferry Crossing in Scotland, she wore a little-seen (but very large) Diamond Thistle Brooch that belonged to Queen Mary. 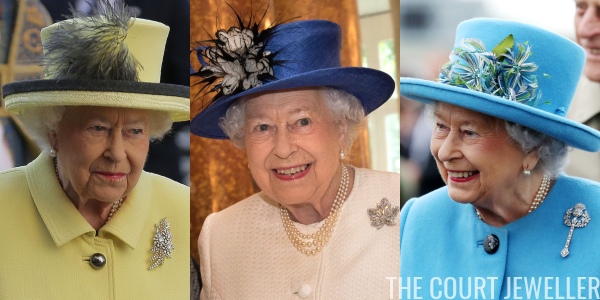 New brooches are still being added to the Queen's collection, but she still reaches for pieces that have been in her jewelry box for more than half a century. The Flame Lily Brooch was presented to her during her 1947 trip to Africa, and her Aquamarine Clips, worn multiple times this year, were her 18th birthday gift in 1944! The Flower Basket Brooch, which she wore at the races this year, was a gift from her parents to mark the birth of Prince Charles in 1948. 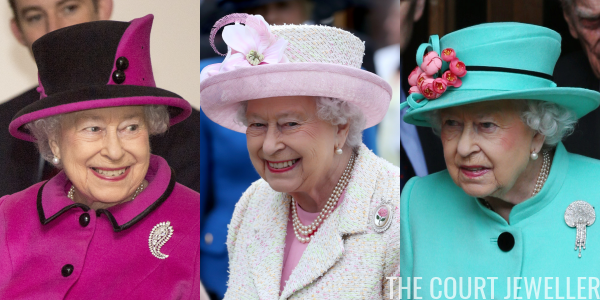 As devoted as she is to the older pieces in her collection, the Queen also likes to wear some of the newer acquisitions she's received more recently. The Chelsea Iris Brooch made its annual appearance at the Chelsea Flower Show this year, while the Bostwana Sorghum Brooch was a surprising choice for the annual Royal Maundy Service. We also saw the Saskatchewan Tourmaline Brooch, a modern floral gift that has become one of the Queen's favorites in recent years. Even among the Queen's vast collection, there are diamond superstars that rise above the rest. The Cullinan V Brooch made numerous appearances this year, including an important outing at the State Opening of Parliament; its cousin, the Cullinan VI and VIII Brooch, also had an airing. One of the lovely Nizam Rose Brooches was a classic choice for the 175th anniversary of the first train journey by a British monarch. And, as always, the Jardine Star Brooch was and is a perennial favorite. We've got one more big brooch occasion for 2017: Christmas Day and the Queen's Christmas Message! 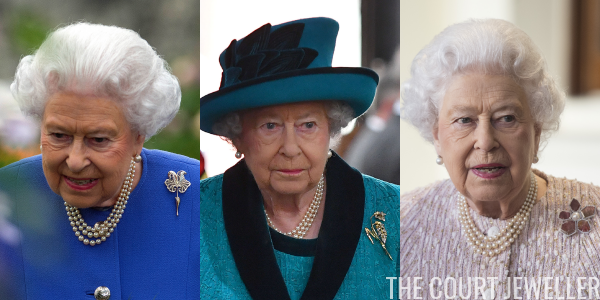 Which brooch do you hope to see her wear in this year's broadcast?